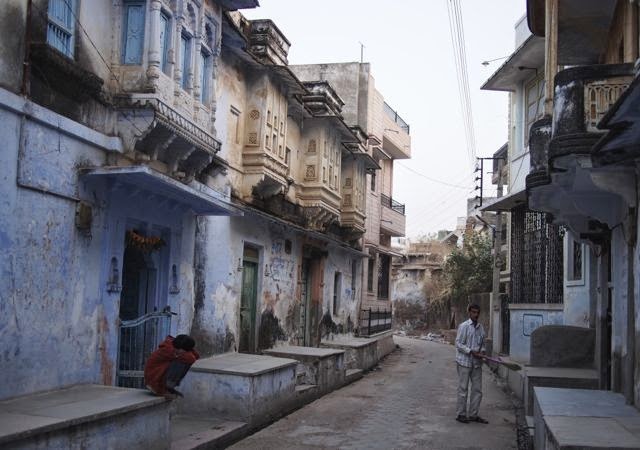 A ramshackle castle with an even more ramshackle village in Rajasthan. Ghanerao Royal Castle is one of a kind- a real aristocratic manor that has kept all of its old-world charm (and old-world plumbing). 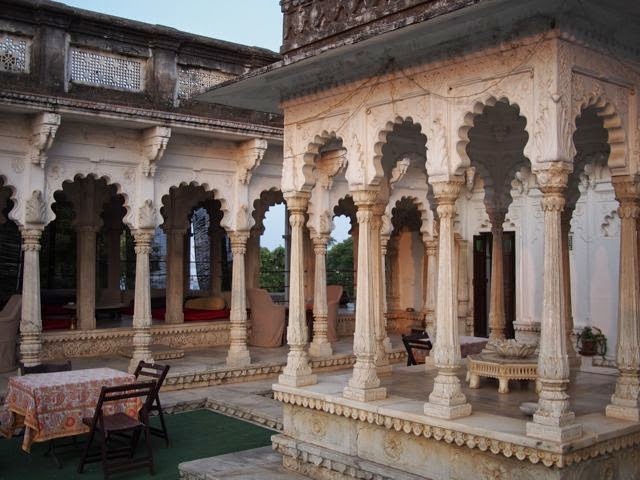 Most Rajasthani heritage hotels have been 'upgraded' to offer a Disneyfied experience. Ghanerao Castle is like staying with an impoverished aristocratic uncle whose house is full of unexpected treasures. 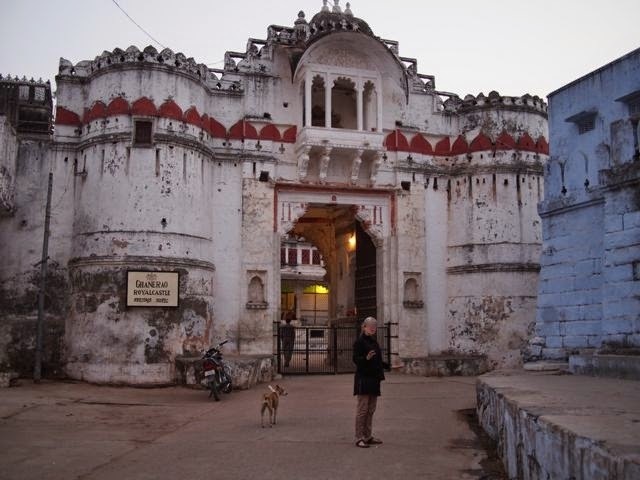 Conveniently located halfway between Udaipur and Jodhpur, Ghanerao makes an excellent stopover as well a great base to explore the Jain temples of Ranakpur and the mighty fort of Kumbalgarh. Map. Although Ghanerao village is definitely part of the attraction, the 'royal castle' of Ganerao is really a sight in its own right and well worth a stopover. You can (and should) stay at the castle, but don't expect a 5* hotel experience. It's more like a homestay, with the difference being that the home is an expansive aristocratic mansion. 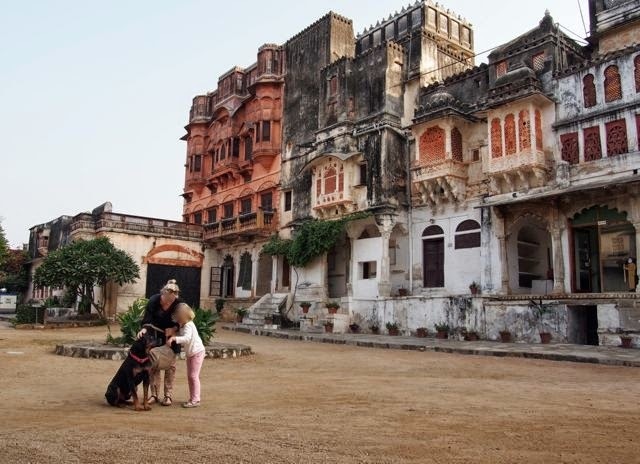 Rather than creating a faux 'ye olde Rajasthan' experience, the family who still owns this mansion decided to leave it as much as possible in the original state. Shabby chic, indeed. The imposing gate of the castle. Right, Ganerao Castle, left, the Royal Dog enjoying some heavy petting. However, for those appreciating peace, quiet, beautiful surroundings, and unlimited quantities of masala chai, it's hard to think of a better place. 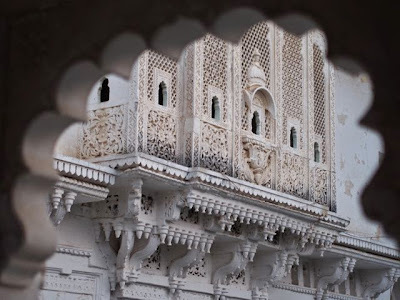 There are three main courtyards, a temple as well as squealing peacocks, but the heart of the castle is a Moghul-style baradari (open arched pavillion) with plenty of space to lounge and get comfy. The Moghul courtyard with its marble baradari. If all the peace and quiet is getting to your head, step outside the castle walls to explore the village. 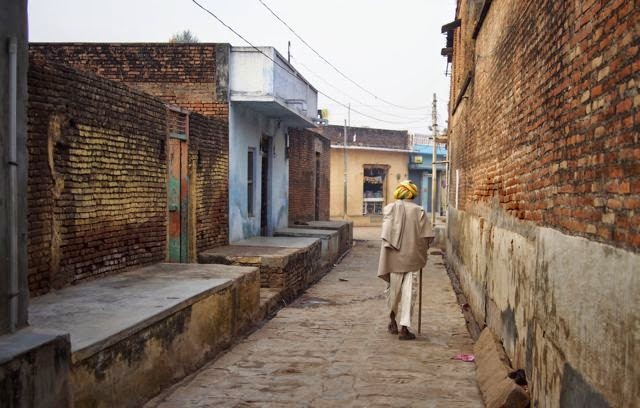 There are several minor sights like royal epitaphs and a number of step wells, but just wandering the streets and counting turbaned senior citizens is an attraction in its own right. ...and lots of turbaned grandfathers. A morning stroll in the village. Public transport is not very reliable in this part of India- it's best to come with your own car and driver. Onward transport can be arranged locally- or keep your driver for the onward journey. Nicely written, and a very useful find of course. Thanks! Thanks! I hope you can make it there one day! 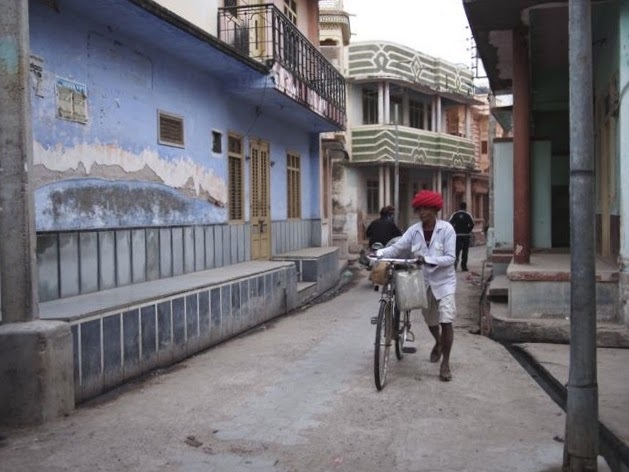 Thanks to Minor Sights, we detoured on our way to Jodhpur, and stayed overnight at Ghanerao. When we arrived, the manager showed us to our beautiful suite, and then proudly gave us a tour of many of the rooms, each one unique, up and down staircases and through twists and turns of passageways. It was like exploring an M.C.Escher house! Drinks on the terrace, then sunset on the roof, with a view of the fort and peacocks. At dinner in the dining room, there were only 2 other people, a dusty old retired couple from England. Very Masterpiece Theatre meets surreal dreamland. Hi Diane, thanks for reporting back! So glad you enjoyed it. This was exactly the kind of experience we had as well. 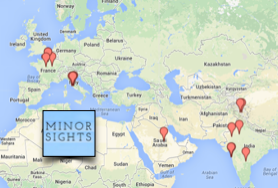 Were you there recently?